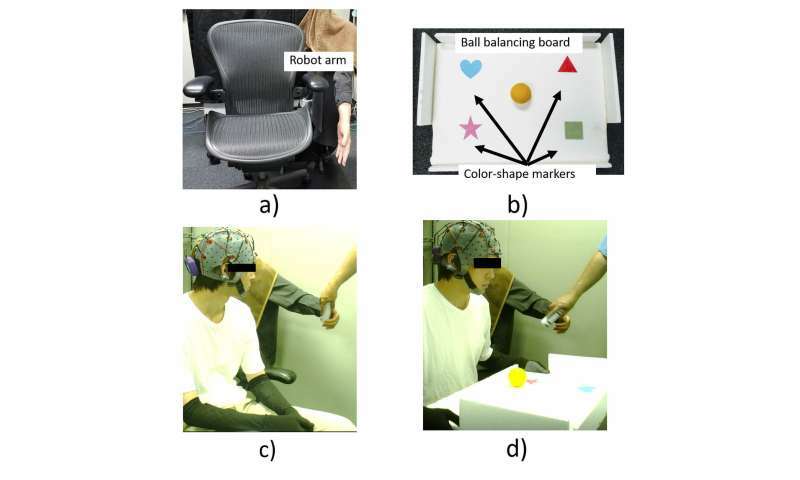 A pair of researchers at Advanced Telecommunications Research Institute International in Japan has developed a brain-machine interface (BMI) to manipulate a robotic arm while the subject's hands engage in a different activity. In their paper published in the journal Science Robotics, Christian Penaloza and Shuichi Nishio describe their system and how well it worked when tested with volunteers. Prior research efforts have led to the development of BMI systems. In such systems, a user wears a cap with electrodes. They perform an activity, such as moving a ball on a table, and the system records the brain wave activity that takes place as the person moves the ball. Next, the person is asked simply to think about moving the ball—the system monitors their brain waves and compares them to the previously stored pattern recorded while moving the ball. When it detects the same brain wave pattern, it engages a robotic arm preprogrammed to mimic the actions of the human activity. The system has been programmed to instigate and reproduce a human activity using human thoughts. As the researchers note, prior efforts with BMI systems have focused only on instigating an activity. In this new effort, Penaloza and Nishio have added to the capability of a BMI system by instigating a desired robotic action using thought alone, while the subject is simultaneously engaged in a second activity. The result is a system that allows a person to control three limbs at once—two natural and one artificial. To test and demonstrate their system, the researchers asked volunteers to participate in BMI training and then to use the system to balance a ball on a flat surface while also using a robotic arm to grab and move an empty soda bottle. The researchers report that the volunteers fell into two groups—those who were quite successful in carrying out the requested tasks, and those who were not. Those in the successful group were able to keep the ball from rolling off the flat surface while mentally requesting the robot to grab and move the bottle 85 percent of the time. Those in the less successful group were only able to accomplish the task 52 percent of the time. It was not clear why some were more successful, but the researchers suggest it had something to do with the volunteers, not the BMI. Brain-machine interface (BMI) systems have been widely studied to allow people with motor paralysis conditions to control assistive robotic devices that replace or recover lost function but not to extend the capabilities of healthy users. We report an experiment in which healthy participants were able to extend their capabilities by using a noninvasive BMI to control a human-like robotic arm and achieve multitasking. Experimental results demonstrate that participants were able to reliably control the robotic arm with the BMI to perform a goal-oriented task while simultaneously using their own arms to do a different task. This outcome opens possibilities to explore future human body augmentation applications for healthy people that not only enhance their capability to perform a particular task but also extend their physical capabilities to perform multiple tasks simultaneously. This is REALY cool! Imagin 4 arms. What a piano player that would make, among other wonderful things.